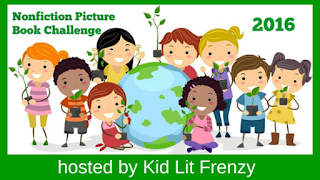 Thanks to Alyson Beecher's Non-Fiction Picture Book Challenge at Kidlit Frenzy, I started reading more non-fiction picture books, and found they taught me as well as entertained me. Hope you will find some good books for yourself as you read my post and others. 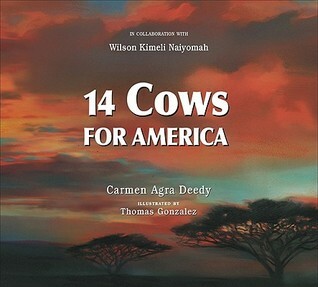 Fourteen Cows for America - written by Carmen Agna Deedy and illustrated by Thomas Gonzalez. I saw this displayed at my library, and had to sit down and enjoy its beautiful story and illustrations all over again. If you've never seen it, you must. It's lovely. It's a fairly straightforward biography, from Hillary's early childhood to a hint that she might be running for president again, which now we know she is. Clearly she is a fierce competitor, persisting in her goals from youth to Secretary of State. She is to be admired for her strength and how much she has fought for women's rights. For middle grades and a bit older, a beginning knowledge of who might be the first woman president. It must be hard to paint people who are so well known. The illustrations are fairly realistic, showing Hillary in various backgrounds, speaking, meeting with important people all over the world. There are so many stories that have never been told in our school history texts, stories about people who persist to have the rights that everyone else has, those they should have. 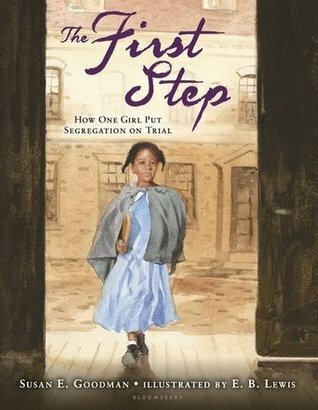 This is one of them, the story of Sarah Roberts, the girl who took it to court to have the right to integrate the schools in Boston. The school where she started was all white, but very close so she was enrolled at the age of four. When a policeman chanced to visit, he threw her out. Her parents were enraged but helpless. They found a young lawyer, the second African- American lawyer in the country. He fought, and was joined by a well-respected white lawyer, Charles Sumner. It was the first time an African-American lawyer had gone before a state Supreme Court. They lost, but set the stage for more. In 1855, Boston was the first city to integrate their schools. Much more information is added in the back, what happened to the key people, an integration timeline, an author's note about writing non-fiction, and more. It's a terrific story. I began my life in a tiny town in the mid-west, moved to a nearby city in middle school. We didn't travel much, and the wide world was only available to me in books. I remember well reading Thor Heyerdahl's Kon-Tiki, and later Aku-Aku about the Easter Island statues. And I was mesmerized. Kon-Tiki opened up a world I would never have known, and I did other research to discover more about the way different peoples of the world ended up where they were. I was so excited to read this book which tells the basics of Heyerdahl's ideas, then his exciting voyage. The pictures are just as exciting, especially those when they were hit by a fierce ocean storm. There is more information in the back matter, including notes and a bibliography. 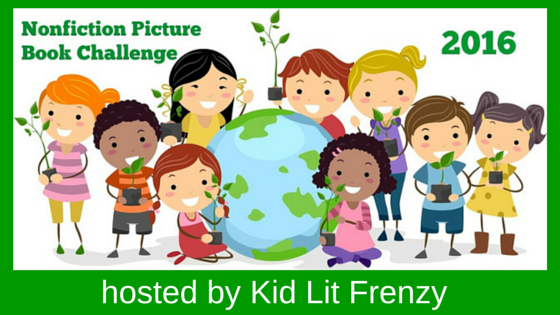 The book will be great for any students doing research of real-life adventures. 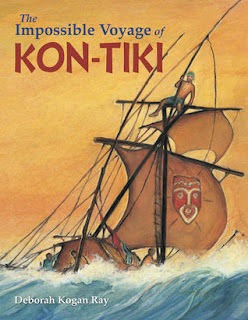 Oh, I love "Kon-Tiki" too, and had no idea there was a picture book! Thanks for sharing! It was a wonderful surprise! Hope you can find and enjoy it! I am interested in seeing the Hillary book. My library doesn't have it yet. I've heard ok things about it. I read the Michelle Markel version that came out in January and it's well done. I think there are three out about Hillary, will look for the others, too, Michele. They will be good for those following the election this year. I had no idea that Boston integrated its schools in the 1800s, I've already learned something new! It's so hard to imagine a young child being expelled from school like that, I'm glad that these stories are being told, so we don't take things for granted that were won for us only through hard work, sacrifice and determination. I didn't know either, Jane, and it truly is an inspiring story. Yes, we need to pay tribute to so many who stepped forward to work for equality. Hope you enjoy the book. 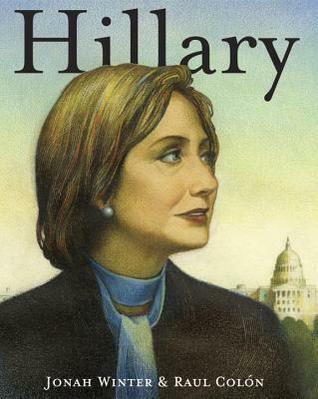 I agree that Jonah Winter did an amazing job on the paintings in the Hillary Clinton book, but I much prefer the Michelle Markel text. I'm interested to see if I can find the third Clinton book you mention in the comments--it's fascinating to compare several books that all come out on the same topic. Glad to hear your opinion of the Markel text. I need to find it so I can compare. 14 Cows for America is fabulous. I haven't seen this bio of Hillary, but have read one by Krull. The best reviews have been of the Markel book. I too appreciated learning about the attempt to integrate the schools in Boston. It's helpful to have books like this to fill in the gaps of my history knowledge. And although I've read specific parts of history, I don't know the parts of history that many of these picture books are telling. I am grateful! I need to get the Markel bio. Others have said it is good. I got the Kon-Tiki book for the same reasons you did Linda. It is on my TBR pile. I am really looking forward to it. And I love 14 Cows for America. It is a stunning book. Thanks, Margie. I'm glad to know about Kon-Tiki, and was so glad to re-read 14 Cows for America again. I just recently read 14 Cows for America.Such a powerful story and wow the illustrations . . . Happy to hear, Carrie! It's truly marvelous!